Five years after the Wilson Robotics team began its inaugural season, one of its teams, "Loose Screws," seized the program's most impressive milestone yet —reaching the robotics world championships for the first time in school history. Loose Screws placed second at the state competition, won an award for their engineering notebook and also won the Innovative Control award at the Western Regional Championships to earn a spot in the robotics world championships in Houston, Texas. 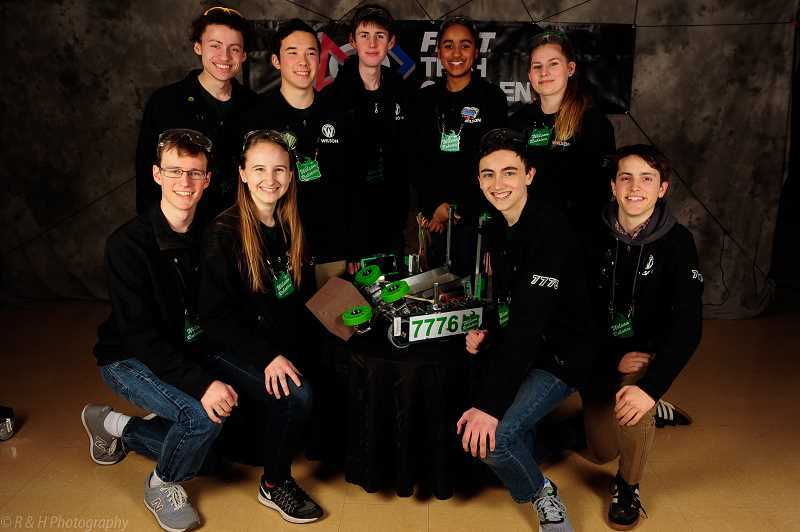 The team, which consists of mostly seniors, reached the Western Regional Championship in 2017 but fell just short of qualifying for the world championships. This year, they righted their mistakes from the previous year and ended up putting forth the 17th best performance in the world at regionals. "I think it's fantastic. We've all put a lot of work into this. I know I've spent at least half or probably more of my winter break just doing autonomous (robot programming)," team member Noah Koontz said. "Seventeenth best in the world and the control award is crazy to think about. That's enough teams that you couldn't even go into a room and see them all." Loose Screws used computer-aided design this year instead of building the robot and then repeatedly rebuilding it. "We can design the robot completely on the computer while someone else can be wiring the robot or Noah can be programming the robot and testing our autonomous," captain Allissa Bergquist said. With the final product finished quicker, the team could focus on mastering other tasks, such as driving the robot. "The temptation for a more junior team is to change the robot up until the last moment," Loose Screws mentor Scott Koontz said. They also added infrared and ultrasound technology while programming the robot after a spotlight befuddled their robot the year before. In determining their competition strategy, Loose Screws kept things simple. Instead of strategizing the best ways to place a figurine in a landing zone outside of the playing field to gain points during matches, they decided to ignore the task all together and instead repeatedly pick up cubes and place them in stacks of boxes to garner points. "We found that was where the most reliable points were. And so we focused all of our energies on that and we ended up scoring the most blocks out of anyone at regionals," Bergquist said. The strategy came in handy in the semifinals of the state competition, where they faced two teams that were superior on paper to Loose Screws and their alliance team. While Loose Screws focused on transporting the cubes, their alliance partner handled the figurines. And in a tie-breaking round, the underdogs triumphed. "It was exhilarating, because going into it we were looking at the numbers and seeing how slim our chances were going to be against them, and we really needed to work with our alliance very flawlessly in order to succeed against these two world-class teams," Bergquist said. Loose Screws also won the Think Award for their comprehensive and detailed engineering notebook, which documented their engineering, programming and building processes as well as the team's outreach activities. They used the program LaTeX, which is often used for scientific journals, to complete the journal. "The level of detail that is in the notebook is pretty phenomenal," Scott Koontz said. The regional competition was more intense then the state competition, Bergquist said. The team faced some of the top teams in the world and lost a few matches after alliance partners' robots sputtered. But Scott Koontz said the team handled the pressure admirably. "They were so composed," he said. 'They knew exactly what they needed to do." To Noah Koontz, the regional competition resembled a convention for robotics fanatics. "One of the amazing aspects of the robotics competitions in general is there are so many people who like robotics," he said. "When you get to the Super Regional competitions, everyone there is very good; they all work really hard on the robots and are all passionate about what they're doing." Loose Screws garnered a spot in the world championships by winning the Innovation in Control award, given to the team with the most unique machine functions, but they also would have made it based on their win-loss record. Scott Koontz credits the team's hard work and discipline for their success this year. The team spent at least 10 to 15 hours a week preparing their robot. While some teams rely a lot on the help of their mentors, in this case the team members' skill level surpassed that of their mentors. "I would hire these kids. The stuff they are doing is not only the engineering skills they're getting. They're like, 'I can solve this. I can build this. I can do this with my hands,'" Scott Koontz said. "But it's also the pressure. In Super Regionals, it was enormous stress and they just had such grace." Bergquist relished the accomplishments and the experience. "It felt fantastic because this is my senior year and robotics has been pretty much my life throughout high school," she said. "It's been one of my favorite things that I've done and we had a goal at the beginning of the season to get to worlds, and to check that off our list was awesome. And also I love my team so much and getting to have another adventure with them was awesome."